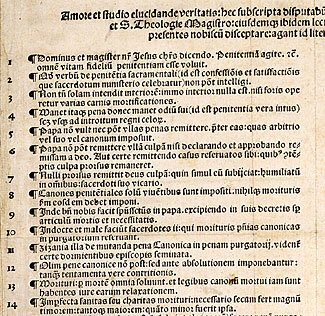 Part of a 1518 printing of Martin Luther’s 95 theses. He had also sent this to the bishop, titled “Disputation of Martin Luther on the Power and Efficacy of Indulgences”; a document comprising 95 short points, and which became known as “The 95 Theses”. This event is often credited as marking the start of The Reformation where breakaway groups separated from the Roman Catholic church. The document was written in church Latin, but was translated into German in January 1518. Within two weeks, copies had spread throughout Germany, and within two months, they had spread throughout most of Europe. Luther not only felt the concept of indulgences was non-Biblical, but was concerned at what he saw as a shift from Bible-supported practices by the church in general. An indulgence was a way for a person to pay a monetary penalty to the church or to do other good works in order to receive forgiveness for sins committed, and was a great money-maker for the church. 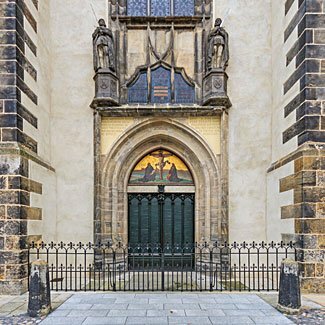 Although considered the foundation of the broader Reformation, the 95 theses focused primarily on three points. The first point was that the selling of indulgences was wrong. At the time, there was an emphasis on collecting as much money as possible to fund the building of St Peter’s in Rome; Luther went as far as to claim the Pope should pay for its construction himself, calling the Pope “richer than Croesus”. The second point was that the entire concept of indulgences was wrong. Luther said the Pope had no power over Purgatory; and further said that if the Pope did have power over Purgatory, why doesn’t he release everyone from Purgatory, for free. Luther’s third point was that being able to buy indulgences encouraged bad behavior and complacency on the part of sinners, and that salvation comes through Christ, not through cash. Luther had an enormous impact on the early Reformation, and wrote/lectured widely on many aspects of core Christian teaching. He was excommunicated in 1521, and later that year the Emperor of the Holy Roman Empire declared (in the Edict of Worms) Luther an outlaw, making it a crime for anyone in Germany to give Luther food or shelter, and permitting anyone to kill Luther without any legal consequence. Notwithstanding this, Luther (born in 1483) lived until dying of general old age in 1546, and was buried in the churchyard of the very church he may have nailed his 95 Theses to the door of, almost 30 years previously. In his later life he strayed into less positive territory, in the form of antagonism towards Jews, advocating polygamy, and declaring the Pope to be the Anti-christ. Here is a copy of the 95 Theses, translated into English. Some editors insert a few Biblical citations at various points; we’ve included these in case they are helpful, but note that Luther’s original statement did not include them. In several of the theses, we’ve added some alternate translation text to hopefully assist in explanation – these are in [square brackets]. You can see Luther’s original statement, in Latin, here. Other English translations can be found here and here. Out of love for the truth and the desire to bring it to light, the following propositions will be discussed and defended at Wittenberg, under the presidency of the Reverend Father Martin Luther, Master of Arts and of Sacred Theology, and Lecturer in Ordinary on the same at that place. Wherefore he requests that those who are unable to be present and debate orally with us, to do so by letter. 1 When our Lord and Master Jesus Christ said, “Repent” (Matthew 4:17) (Poenitentiam agite etc), he willed the entire life of believers to be one of repentance. 2 This word [penance] cannot be understood as referring to the sacrament of penance, that is, confession and satisfaction, as administered by the clergy. 3 Yet it does not mean solely inner repentance; such inner repentance is worthless unless it produces various outward mortifications of the flesh [ie things such as fasting, abstinence and pious kneeling]. 4 The penalty of sin remains as long as the hatred of self (that is, true inner repentance), namely till our entrance into the Kingdom of Heaven. 5 The Pope neither desires nor is able [has neither the will nor the power] to remit any penalties except those imposed by his own authority or that of the canons. 6 The Pope cannot remit [forgive] any guilt, except by declaring and showing that it has been remitted by God; or, to be sure, by remitting guilt in cases reserved to his judgment [he has judged]. If his right to grant remission [forgiveness] in these cases were disregarded, the guilt would certainly remain unforgiven. 7 God remits guilt to no one unless at the same time he humbles him in all things and makes him submissive to the [his] vicar, the priest. 8 The penitential canons are imposed only on the living, and, according to the canons themselves, nothing should be imposed on the dying. 9 Therefore the Holy Spirit [acting] through the Pope is kind to us insofar as the Pope in his decrees always makes exceptions of the article of death and of necessity. 10 Those priests act ignorantly [unreasonably] and wickedly who, in the case of the dying, reserve canonical penalties for Purgatory. 11 Those tares [abuse] of changing the canonical penalty to the penalty of Purgatory were evidently sown while the bishops slept (Matthew 13:25). 12 In former times canonical penalties were imposed, not after, but before absolution, as tests of true contrition [repentance]. 13 The dying are freed by death from all penalties, are already dead as far as the canon laws are concerned, and have a right to be released from them. 14 Imperfect [spiritual] piety or love on the part of the dying person necessarily brings with it great fear; and the smaller the love, the greater the fear. 15 This fear or horror is sufficient in itself, to say nothing of other things, to constitute the penalty of Purgatory, since it is very near to the horror of despair. 16 Hell, Purgatory, and Heaven seem to differ the same as despair, fear, and assurance of salvation. 17 It seems as though for the souls in Purgatory fear should necessarily decrease and love increase. 18 Furthermore, it does not seem proved, either by reason or by Scripture, that souls in Purgatory are outside the state of merit, that is, unable to grow in love. 19 Nor does it seem proved that souls in Purgatory, at least not all of them, are certain and assured of their own salvation, even if we ourselves may be entirely certain of it. 20 Therefore the Pope, when he uses the words “plenary remission of all penalties,” does not actually mean “all penalties”, but only those imposed by himself. 21 Thus those indulgence preachers are in error who say that a man is absolved from every penalty and saved by papal indulgences. 22 As a matter of fact, the Pope remits to souls in Purgatory no penalty which, according to canon law, they should have paid in this life. 23 If remission of all penalties whatsoever could be granted to anyone at all, certainly it would be granted only to the most perfect, that is, to very few. 24 For this reason most people are [necessarily] deceived by the high-sounding [boastful] promise of indiscriminate release from penalty. 25 That [same] power which the Pope has [in general] over Purgatory corresponds to the [same] power which any bishop or curate has [in a particular way] in his own diocese and parish. 26 The Pope does very well [acts most rightly] when he grants remission to souls in Purgatory, not by the power of the keys [to the Church], which he does not have, but by way of intercession for them. 27 They preach only human doctrines [vanity] who say that as soon as the money clinks into the money chest, the soul flies out of Purgatory. 28 It is certain that when money clinks in the money chest, greed and avarice increases; but when the church intercedes, the result is in the hands of God alone. 29 Who knows whether all souls in Purgatory wish to be redeemed, since we have exceptions in St. Severinus and St. Paschal, as related in a legend. 30 No one is sure of the integrity of his own contrition [having repented sincerely enough], much less of having received plenary remission [complete remission/forgiveness of his sins]. 31 The man who actually buys indulgences is as rare as he who is really penitent; indeed, he is exceedingly rare. 32 Those who believe that they can be certain of their salvation because they have indulgence letters will be eternally damned, together with their teachers. 33 Men must especially be on guard against those who say that the Pope’s pardons are that inestimable gift of God by which man is reconciled to him. 34 For the graces of indulgences are concerned only with the penalties of sacramental satisfaction established by man [ie indulgences can only replace the penalties levied via sacramental atonement]. 35 They who teach that [repentance and] contrition is not necessary on the part of those who intend to buy souls out of Purgatory or to buy confessional privileges preach unchristian doctrine. 36 Any truly repentant Christian has a right to full remission of penalty and guilt, even without indulgence letters. 37 Any [every] true Christian, whether living or dead, participates in all the blessings of Christ and the Church; and this is granted him by God, even without indulgence letters. 38 Nevertheless, papal remission and blessing are by no means to be disregarded, for they are, as I have said (Thesis 6), the proclamation of the divine remission. 39 It is very difficult, even for the most learned theologians, at one and the same time to commend to the people the bounty of indulgences and the need for [truth of] true contrition. 40 A Christian who is truly contrite seeks and loves to pay penalties for his sins; the bounty of indulgences, however, relaxes penalties and causes men to hate them – at least it furnishes occasion for hating them. 41 Papal indulgences must be preached with caution, lest people erroneously think they are preferable to other good works of love [charity]. 42 Christians are to be taught the Pope does not intend that the buying of indulgences should in any way be compared with works of mercy. 44 Because love [charity] grows by works of love [charity], man thereby becomes better. Man does not, however, become better by means of indulgences but is merely freed from penalties [punishment]. 45 Christians are to be taught that he who sees a needy man and passes him by, yet gives his money for indulgences, does not buy [receive] papal indulgences but [instead receives] God’s wrath. 46 Christians are to be taught that, unless they have more than they need, they must reserve enough for their family needs and by no means squander it on indulgences. 47 Christians are to be taught that they buying of indulgences is a matter of free choice, not commanded. 48 Christians are to be taught that the Pope, in granting [selling] indulgences, needs and thus desires [has more want and more desire for] their devout prayer more than their money. 49 Christians are to be taught that papal indulgences are useful only if they do not put their trust in them, but very harmful if they lose their fear of God because of them. 50 Christians are to be taught that if the Pope knew the exactions [the ways and doings] of the indulgence preachers, he would rather that the basilica of St. Peter were burned to ashes than built up with the skin, flesh, and bones of his sheep. 51 Christians are to be taught that the Pope would and should wish [as it is his bounden duty to do] to give of his own money [if there is need], even though he had to sell the basilica of St. Peter, to many of those from whom certain hawkers of indulgences cajole [extort] money. 52 It is vain to trust in salvation by indulgence letters, even though the indulgence commissary [agent, person selling the indulgence], or even the Pope, were to offer his soul as security. 53 They are the enemies of Christ and the Pope who forbid altogether the preaching of the Word of God in some churches in order that indulgences may be preached in others. 54 Injury is done to the Word of God when, in the same sermon, an equal or larger amount of time is devoted to indulgences than to the Word [Gospel]. 55 It is certainly [surely should be] the Pope’s sentiment that if indulgences, which are a very insignificant thing, are celebrated with one bell, one procession, and one ceremony, then the Gospel, which is the very greatest thing, should be preached with a hundred bells, a hundred processions, a hundred ceremonies. 56 The true treasures of the Church, out of which the Pope distributes indulgences, are not sufficiently discussed or known among the people of Christ. 57 That indulgences are not temporal treasures is certainly clear, for many indulgence sellers do not distribute them freely but only gather them. 58 Nor are they the merits of Christ and the saints, for, even without the Pope, they will always work grace for the inner man, and the cross, death, and hell for the outer man. 59 St. Lawrence said that the poor of the church were the treasures of the Church, but he spoke according to the usage of the word in his own time. 60 Without want of consideration [After careful consideration] we say that the keys of the Church, given by the merits of Christ, are that treasure. 61 For it is clear that the Pope’s power is of itself sufficient for the remission of penalties [and forgiveness] in cases reserved by himself. 62 The true treasure of the Church is the most Holy Gospel of the glory and grace of God. 63 But this treasure is naturally most odious [hateful], for it makes the first to be last (Matthew 20:16). 64 On the other hand, the treasure of indulgences is naturally most acceptable [agreeable], for it makes the last to be first. 65 Therefore the treasures of the Gospel are nets with which one formerly fished for men of wealth. 66 The treasures of indulgences are nets with which one now fishes for the wealth of men. 67 The indulgences which the preachers acclaim as the greatest graces are actually understood to be such only insofar as they promote gain. 68 They are nevertheless in truth the most insignificant graces when compared with the grace of God and the piety of the cross. 69 Bishops and curates are bound to admit the commissaries of papal indulgences with all reverence. 70 But they are much more bound to strain their eyes and ears lest these men preach their own dreams instead of what the Pope has commissioned. 71 Let him who speaks against the truth concerning papal indulgences be anathema and accursed. 72 But let him who guards against the lust and license of the indulgence preachers be blessed. 73 Just as the Pope justly thunders against [disgraces and excommunicates] those who by any means whatever contrive harm to the sale of indulgences. 74 Much more does he intend to thunder against [disgrace and excommunicate] those who use indulgences as a pretext to contrive harm to holy love and truth. 75 To consider papal indulgences so great that they could absolve a man even if he had done the impossible and had violated the Mother of God is madness. 76 We say, on the contrary, that papal indulgences cannot remove the very least of venial sins as far as guilt is concerned. 77 To say that even St. Peter if he were now Pope, could not grant greater graces [mercies] is blasphemy against St. Peter and the Pope. 78 We say on the contrary that even the present Pope, or any Pope whatsoever, has greater graces [mercies] at his disposal, such as, the gospel,spiritual powers, gifts of healing, etc., as it is written in 1 Corinthians 12. [See particularly 1 Cor 12:28]. 79 To say that the cross emblazoned with the papal coat of arms, and set up by the indulgence preachers is equal in worth to the cross of Christ is blasphemy. 80 The bishops, curates, and theologians who permit such talk to be spread among the people will have to answer for this. 81 This unbridled preaching of indulgences makes it difficult even for learned men to rescue the reverence which is due the Pope from slander or from the shrewd questions of the laity. 82 Such as: “Why does not the Pope empty purgatory for the sake of holy love and the dire need of the souls that are there if he redeems an infinite number of souls for the sake of miserable money with which to build a church [St Peter’s Basilica in Rome]? The former reason would be most just; the latter is most trivial. 90 To repress these very sharp arguments of the laity by force alone, and not to resolve them by giving reasons, is to expose the Church and the Pope to the ridicule of their enemies and to make Christians unhappy. 91 If, therefore, indulgences were preached according to the spirit and intention of the Pope, all these doubts would be readily resolved. Indeed, they would not exist. 93 Blessed be all those prophets who say to the people of Christ, “Cross, cross”, and there is no cross! 94 Christians should be exhorted to be diligent in following Christ, their Head, through penalties [cross], death and hell. 95 And thus be confident of entering into Heaven through many tribulations rather than through the false security of peace (Acts 14:22).